Packaging Design Corporation is an industry leader in providing branded packing and retail display stands using premium quality affordable custom corrugated boxes for a wide range of industries and applications. Custom corrugated boxes used for the creation of product packaging and display models are light, compact, and can be used and re-used at your convenience and need. Trust the industry professionals at Packing Design Corporation to find efficient and cost-effective solutions to your branded custom corrugate boxes. For complete information on the complete product line of display and packaging boxes, call 630-323-1354 today and speak to a friendly and knowledgeable representative at Packing Design Corporation. Feel free to email anytime at info@pack-design.com or fill out the contact form to the right and we will respond shortly. Located in Chicago’s near suburbs, Packing Design Corporation has a team of talented and experienced professionals who use the very latest technological advances and process innovations to supply superior product at the best prices. An extraordinary customer service team works hard every day to put your branded packaging needs first. A talented team of industry specialists is dedicated to making sure all your branded packaging and display needs are met on time, and on budget. Packaging Design Corporation has an impressive staff of dedicated packing experts who will partner with you to keep your product safe from damage and boost brand recognition to engage shoppers, and increase sales while cutting production and distribution costs. 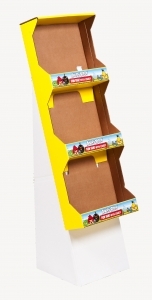 For complete information on the complete product line of display and packaging boxes, call 630-323-1354 today and speak to a friendly and knowledgeable representative at Packing Design Corporation.